In addition to Talk French, which we released a week ago, these Talking Phrasebooks will help you find your way around Europe. Our Talking Phrasebooks contain over 290 useful phrases in 14 different categories. For those who don’t want to explore the different categories, we’ve created a search function. Simply type in a few keywords to have the phrase pop up. All phrases are displayed in English and their respective alternate language. After selecting a phrase you can of course try to master it yourself, or you could let your phone do the talking! Whatever the purpose of your trip is, you should always take a Talking Phrasebook with you. Get the Talking Phrasebooks for $1.99 a piece on Google Play. 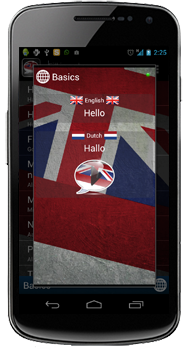 Talking Phrasebooks for English are compatible with all Mobile Devices running Android 1.6 and up.